There were two surprise badass additions to 2013’s slew of sequels and super heroes; The Raid and Dredd. While The Raid is eagerly expecting a sequel later this year, Karl Urban’s future lawbastard is facing a harder time returning to the screens. Despite being quite a confined, niche film, it cost a considerable $50 to make, thanks chiefly to the addition of 3D. While some of the 3D effects were good (notably the “Slow-Mo” effect), it was otherwise needless, and set the bar too high for the studios to make their money back. A disappointing performance at the box office effectively shelved any plans for a sequel, however the film has since found it’s audience on DVD and Blu-Ray. Now there are more rumblings of a sequel, especially after the success of an online petition. While this is nothing new in Hollywood (Firefly, anyone? ), screenwriter Alex Garland and Karl Urban are both keen to return to Megacity. In fact, while being questioned at a recent Star Trek event, urban revealed that he’d talked with the studio, Lionsgate, about a sequel. While no sequel is on the table yet, they did seemingly admit they’d botched the marketing of the first film, and they were pleased it had become successful on DVD. Finally, Karl Urban, in his infinite coolness, has even spoken to IGN about what he wants to see in a possible sequel. So will we see another badass Dredd adventure? Will it be another adult, R-rated 18+ affair? We can only hope. Be sure to check back, as we’ll have the latest scoop as and when it’s reported! 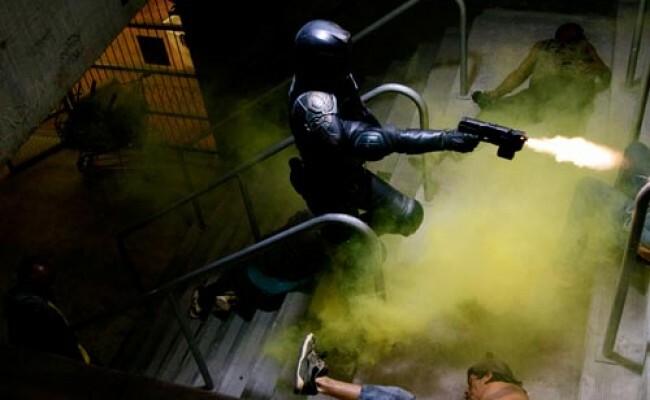 This entry was posted in News and tagged Badass, Dredd 2013, Dredd Sequel, Judge Dredd, Karl Urban, The Raid, The Raid 2. Bookmark the permalink.